I like to watch people. The backstage of an event is often more interesting to me than the event itself. What happens when no one is looking (except for me) I find fascinating. Recently, I’ve been watching what may be an interesting cultural trend. My son is part of a weekend program that offers many challenging classes for gifted students. We love it. The two classes he takes have about 30 kids in one class and 15 in the other. Because some families have more than one kids in a class at a time, parents are not always fully represented, so some kids are in class by themselves, while others are there with one or both parents. Both classes involve a lot of construction. The kids may build complex items, such as a soldered circuit board. Pretty ambitious stuff. Again, challenging for the kids. I’ve been there for both classes. What has struck me is the dynamic of helping others. When presented with a task, the majority of parents focus solely on helping their own child, despite the fact that other children have no parent present to help. Also, while plenty of opportunities to assist the teacher of class exist, not many people jump at the chance. A few parents assist those children who have no parents present. A few generally help the teacher with whatever needs to be done to make the class work. A few. But most parents turn all their attention to their own child. I’ve written many times about the island mentality in America 2010. I see a country where people increasingly focus on their own family unit to the exclusion of others. Some believe this is the aftermath of cocooning wrought by 9/11. I contend that cocooning has transformed into islanding. Some scientists say that the continents began as one land mass called Pangaea. 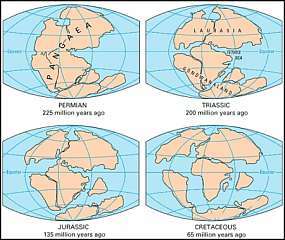 Time and tectonics eventually tore Pangaea into smaller chunks that became the recognizable individual continents and islands. In many ways, our communities and sense of common national identity are being torn asunder by the tectonic shifts of societal change. The entire idea of community increasingly suffers when people turn their community into a sea filled with tiny islands with a common sea between them, but no real contact between the islands. The sea, rather than being a means of travel and connection, becomes a moat that keeps others out. What is particularly sad is that these human islands “evolve” their own ecoculture that, in time, cannot abide the ecocultures of the other islands. Anyone who follows the travails of Australia in that country/island’s fight against cane toads and rabbits knows that being too different in one’s ecoculture wreaks havoc when an outsider comes in. So, some islands work very hard to keep the outsiders out. And the fracture lines keep widening. This should not surprise us, though. Darwinism, one of the core philosophies of contemporary society, wormed its way into the minds of too many people. We made peace with the “selfish gene” and incorporated “survival of the fittest” into our worldview. We see others as competition. “Only the strong survive.” We must protect our own, even if it comes at the expense of others individually and our communities as a whole. Or so it is said. A couple months ago, I mentioned that the youth pastor at my church lamented his inability to get youth groups from other churches together to do combined community projects. Too many other churches feared their youth would be poached by a “competing” church. Island thinking exist in Christianity, too. God didn’t make us to live as islands, though. Our families are not intended to be so sacrosanct that no one else is allowed in, or that others exist only to get in the family’s way. This is especially true of the Church. Jesus repeatedly said that the family of God is not an island, that ANY who do the will of God are invited in. There are no strangers, only those who have not yet come into the fold. And on the cross, Jesus shattered the idea of boundaries of biological family by entrusting His mother to the care of His youngest follower, and vice versa. If we are to be a true reflection of the Church that God intends, we have to get rid of the moat. We can’t be an island, other than to be a place of refuge amongst cultural and societal insanity. Because the model we have from the Bible is not an island. Nor does the Bible preach the nuclear family to the detriment of those whose biological family does not look like our own. The Church should NEVER be afraid of the outsider, because such was each one of us before Christ restored us. Is it that hard to put down “our thing”—whatever it may be—to help another? Do we not have some sense that we are diminished ourselves when others go wanting? Why must we work so hard to protect our own that we have nothing else left over to give to those not our own? Must we live by the survival of the fittest? And lastly, why are we so proud of our personal island when God has no place for islands in His Kingdom?